Chatham Mills Farmers’ Market offers a variety of fresh and local produce, meats and poultry as well as local plants and crafts. Vendors vary by week and are posted on the website. Some of the vendors you will see at the Chatham Mills Farmers’ Market are: Cane Creek Farms, CATHIS Farm, Cool Springs Farm, Grand Hope Farm, Heartstrong Farm, Hill View Farm, Red Roots Farm, Carol’s Good Earth, Growing Wild Nursery, McWoukinn Farm, Blue Roses Design, and The Yeast Roll Company. 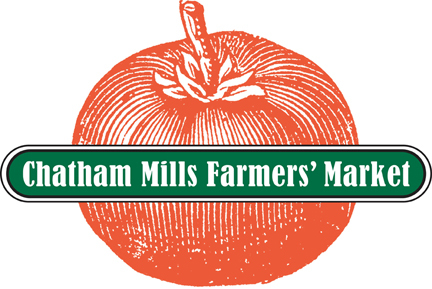 The Chatham Mills Farmers’ Market was founded by local farmers with the support of NC Cooperative Extension, Chatham Mills and Chatham Marketplace as a producers-only market. April – October: 8 a.m. – 12 p.m.
November – January: 10 a.m. – 1 p.m.